Why would a grown man chase hornets with a thermometer, paint whirligig beetles bright red, or track elephants through the night to fill trash bags with their prodigious droppings? Some might say--to advance science. Heinrich says--because it's fun. Bernd Heinrich, author of the much acclaimed "Bumblebee Economics," has been playing in the wilds of one continent or another all his life. In the process, he has become one of the world's foremost physiological ecologists. "With In a Patch of Fireweed," he will undoubtedly become one of our foremost writers of popular science. Part autobiography, part case study in the ways of field biology, "In a Patch of Fireweed" is an endlessly fascinating account of a scientist's life and work. For the author, it is an opportunity to report not just his results but the curiosity, humor, error, passion, and competitiveness that feed into the process of discovery. For the reader, it is simply a delight, a rare chance to share the perceptions of an unusual mind fully in tune with the inner workings of nature. 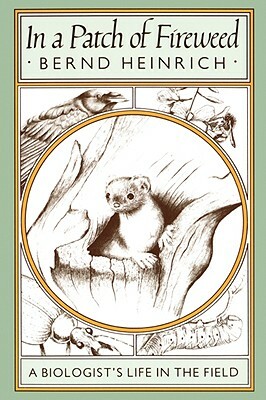 Before his years of research in the woodlands and deserts of North America, the New Guinea highlands, and the plains of East Africa, Heinrich had a sense of the wild that few people in this century can know. He tells the whole story, from his refugee childhood hidden in a German forest, eating mice fried in boar fat, to his ongoing research in the woods surrounding his cabin in Maine. Keywords: BIOLOGY. ZOOOLOGY. INSECTS. FIELDWORK.